Teacher educator candidates desiring to be certified to teach Business and Finance to 6-12 grade students in the state of Texas will need to take this exam. The exam insures that teacher candidates possess the knowledge and skills necessary to teach in the Texas public schools. Beginning September 1, 2018, TExES certification exams will be administered by Pearson. To register to take an exam, all candidates will need to create a testing account on the Pearson website. Once an account is created, the candidate can register, submit payment, and schedule a convenient time to take the exam. Beginning September 1, 2018, most TExES exams will cost $116. Testing facilities are located in various cities throughout Texas. Before submitting registration, you will be able to view the testing dates and locations. How many questions are on the exam and what format is used for the questions? The computer-administered test (CAT) consists of 100 multiple-choice questions. The multiple-choice questions are in various formats. Some questions will instruct you to choose the correct answer, other questions will ask you to select all that apply, some questions will require you to type answers in an entry box, some questions may instruct you to click a location on a graphic, some questions may require you to drag and drop answer choices onto a graphic, and other questions may include a drop-down menu from which the correct answer will be selected. Each question should be read carefully to understand the instructions for each question. A maximum of 5 hours is allowed for the exam. 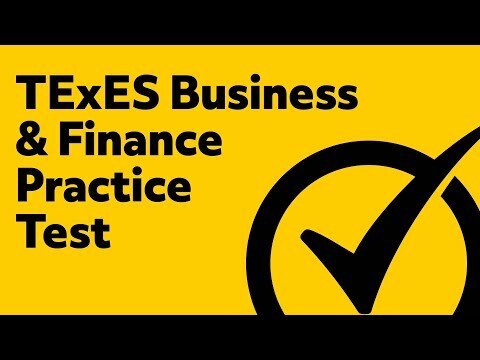 What is the content of the TExES Business and Finance 6-12 exam? The exam includes 5 content domains based on the TExES Educator standards. Although the exam consists of 100 questions, only 80 questions are scored. The remaining questions are pilot questions and are not used in the calculation of the final score. The pilot questions are not identified so all questions should be answered. A question that is not answered is marked as incorrect. What if I do not achieve a passing score? If you have not reached the retake limit of 5 attempts, you may register to take the exam again. How can I best prepare to take the exam? The TExES Business and Finance 6-12 exam is a content-driven test; therefore, adequate preparation using high quality study materials are important. Mometrix, the world’s #1 test preparation company, offers two ways to assist you in this endeavor. Our test experts have taken hundreds of critical concepts covered on this TExES exam and put them in our TExES Business and Finance 6-12 Secrets Study Guide. These same critical concepts have also been put on professional quality flashcards. When you order either our study guide or flashcards, we will also include exam practice test questions, study secrets, a special report on how to overcome test anxiety and more. The Mometrix 1-year money-back guarantee means you have nothing to lose by ordering our study guide or flashcards. 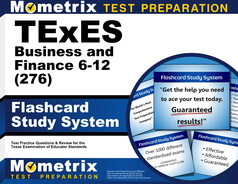 What can be gained by ordering the TExES Business and Finance 6-12 study guide or flashcards? Success on the exam! Mometrix Academy is a completely free resource provided by Mometrix Test Preparation. If you find benefit from our efforts here, check out our premium quality TExES Business and Finance 6-12 study guide to take your studying to the next level. 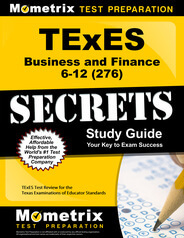 Just click the TExES Business and Finance 6-12 study guide link below. Your purchase also helps us make even more great, free content for test-takers.